Barrett's esophagus is a condition in which there is an abnormal (metaplastic) change in the mucosal cells lining the lower portion of the esophagus, from normal stratified squamous epithelium to simple columnar epithelium with interspersed goblet cells that are normally present only in the stomach, small intestine, and large intestine. This change is considered to be a premalignant condition because it is associated with a high incidence of further transition to esophageal adenocarcinoma, an often-deadly cancer. The main cause of Barrett's esophagus is thought to be an adaptation to chronic acid exposure from reflux esophagitis. Barrett's esophagus is diagnosed by endoscopy: observing the characteristic appearance of this condition by direct inspection of the lower esophagus; followed by microscopic examination of tissue from the affected area obtained from biopsy. The cells of Barrett's esophagus are classified into four categories: nondysplastic, low-grade dysplasia, high-grade dysplasia, and frank carcinoma. High-grade dysplasia and early stages of adenocarcinoma may be treated by endoscopic resection or radiofrequency ablation. Later stages of adenocarcinoma may be treated with surgical resection or palliation. Those with nondysplastic or low-grade dysplasia are managed by annual observation with endoscopy, or treatment with radiofrequency ablation. In high-grade dysplasia, the risk of developing cancer might be at 10% per patient-year or greater. The incidence of esophageal adenocarcinoma has increased substantially in the Western world in recent years. The condition is found in 5–15% of patients who seek medical care for heartburn (gastroesophageal reflux disease, or GERD), although a large subgroup of patients with Barrett's esophagus are asymptomatic. The condition is named after surgeon Norman Barrett (1903–1979). Despite this, the condition was originally described by Philip Rowland Allison in 1946. The risk of developing Barrett's esophagus is increased by central obesity (vs. peripheral obesity). The exact mechanism is unclear. The difference in distribution of fat among men (more central) and women (more peripheral) may explain the increased risk in males. Barrett's esophagus occurs due to chronic inflammation. The principal cause of the chronic inflammation is gastroesophageal reflux disease, GERD (UK: GORD). In this disease, acidic stomach, bile, and small intestine and pancreatic contents cause damage to the cells of the lower esophagus. Recently, bile acids were shown to be able to induce intestinal differentiation, in gastroesophageal junction cells, through inhibition of the epidermal growth factor receptor (EGFR) and the protein kinase enzyme Akt. This results in the eventual up-regulation of the p50 subunit of protein complex NF-κB (NFKB1), and ultimately activation of the homeobox gene CDX2, which is responsible for the expression of intestinal enzymes such as guanylate cyclase 2C. This mechanism also explains the selection of HER2/neu (also called ERBB2) and the overexpressing (lineage-addicted) cancer cells during the process of carcinogenesis, and the efficacy of targeted therapy against the Her-2 receptor with trastuzumab (Herceptin) in the treatment of adenocarcinomas at the gastroesophageal junction. Researchers are unable to predict who with heartburn will develop Barrett's esophagus. While no relationship exists between the severity of heartburn and the development of Barrett's esophagus, a relationship does exist between chronic heartburn and the development of Barrett's esophagus. Sometimes, people with Barrett's esophagus have no heartburn symptoms at all. In rare cases, damage to the esophagus may be caused by swallowing a corrosive substance such as lye. Both macroscopic (from endoscopy) and microscopic positive findings are required to make a diagnosis. 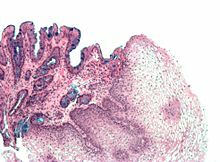 Barrett's esophagus is marked by the presence of columnar epithelia in the lower esophagus, replacing the normal squamous cell epithelium—an example of metaplasia. The secretory columnar epithelium may be more able to withstand the erosive action of the gastric secretions; however, this metaplasia confers an increased risk of adenocarcinoma. Screening endoscopy is recommended among males over the age of 60 who have reflux symptoms that are of long duration and not controllable with treatment. Among those not expected to live more than 5 years screening is not recommended. The presence of goblet cells, called intestinal metaplasia, is necessary to make a diagnosis of Barrett's esophagus. This frequently occurs in the presence of other metaplastic columnar cells, but only the presence of goblet cells is diagnostic. The metaplasia is grossly visible through a gastroscope, but biopsy specimens must be examined under a microscope to determine whether cells are gastric or colonic in nature. Colonic metaplasia is usually identified by finding goblet cells in the epithelium and is necessary for the true diagnosis. Many histologic mimics of Barrett's esophagus are known (i.e. goblet cells occurring in the transitional epithelium of normal esophageal submucosal gland ducts, "pseudogoblet cells" in which abundant foveolar [gastric] type mucin simulates the acid mucin true goblet cells). Assessment of relationship to submucosal glands and transitional-type epithelium with examination of multiple levels through the tissue may allow the pathologist to reliably distinguish between goblet cells of submucosal gland ducts and true Barrett's esophagus (specialized columnar metaplasia). Use of the histochemical stain Alcian blue pH 2.5 is also frequently used to distinguish true intestinal-type mucins from their histologic mimics. Recently, immunohistochemical analysis with antibodies to CDX-2 (specific for mid and hindgut intestinal derivation) has also been used to identify true intestinal-type metaplastic cells. The protein AGR2 is elevated in Barrett's esophagus and can be used as a biomarker for distinguishing Barrett epithelium from normal esophageal epithelium. The presence of intestinal metaplasia in Barrett's esophagus represents a marker for the progression of metaplasia towards dysplasia and eventually adenocarcinoma. This factor combined with two different immunohistochemical expression of p53, Her2 and p16 leads to two different genetic pathways that likely progress to dysplasia in Barrett's esophagus. Also intestinal metaplastic cells can be positive for CK 7+/CK20-. After the initial diagnosis of Barrett's esophagus is rendered, affected persons undergo annual surveillance to detect changes that indicate higher risk to progression to cancer: development of epithelial dysplasia (or "intraepithelial neoplasia"). Among all metaplastic lesions, around 8% were associated with dysplasia. particularly a recent study demonstrated that dysplastic lesions were located mainly in the posterior wall of the Oesophagus. Considerable variability is seen in assessment for dysplasia among pathologists. Recently, gastroenterology and GI pathology societies have recommended that any diagnosis of high-grade dysplasia in Barrett be confirmed by at least two fellowship-trained GI pathologists prior to definitive treatment for patients. For more accuracy and reproductibility, it is also recommended to follow international classification system as the "Vienna classification" of gastrointestinal epithelial neoplasia (2000). Many people with Barrett's esophagus do not have dysplasia. Medical societies recommend that if a patient has Barrett's esophagus, and if the past two endoscopy and biopsy examinations have confirmed the absence of dysplasia, then the patient should not have another endoscopy within three years. Endoscopic surveillance of people with Barrett's esophagus is often recommended, although little direct evidence supports this practice. Treatment options for high-grade dysplasia include surgical removal of the esophaguses (esophagectomy) or endoscopic treatments such as endoscopic mucosal resection or ablation (destruction). The risk of malignancy is highest in the U.S. in Caucasian men over fifty years of age with more than five years of symptoms. Current recommendations include routine endoscopy and biopsy (looking for dysplastic changes). Although in the past physicians have taken a watchful waiting approach, newly published research supports consideration of intervention for Barrett's esophagus. Balloon-based radiofrequency ablation, invented by Ganz, Stern, and Zelickson in 1999, is a new treatment modality for the treatment of Barrett's esophagus and dysplasia, and has been the subject of numerous published clinical trials. The findings demonstrate radiofrequency ablation has an efficacy of 90% or greater with respect to complete clearance of Barrett's esophagus and dysplasia with durability up to five years and a favorable safety profile. Anti-reflux surgery has not been proven to prevent esophageal cancer. However, the indication is that proton pump inhibitors are effective in limiting the progression of esophageal cancer. Laser treatment is used in severe dysplasia, while overt malignancy may require surgery, radiation therapy, or systemic chemotherapy. A recent five-year random-controlled trial has shown that photodynamic therapy using photofrin is statistically more effective in eliminating dysplastic growth areas than sole use of a proton pump inhibitor. There is presently no reliable way to determine which patients with Barrett's esophagus will go on to develop esophageal cancer, although a recent study found the detection of three different genetic abnormalities was associated with as much as a 79% chance of developing cancer in six years. Endoscopic mucosal resection has also been evaluated as a management technique. Additionally an operation known as a Nissen fundoplication can reduce the reflux of acid from the stomach into the esophagus. In a variety of studies, nonsteroidal anti-inflammatory drugs (NSAIDS), like aspirin, have shown evidence of preventing esophageal cancer in people with Barrett's esophagus. However, none of these studies have been randomized, placebo-controlled trials, which are considered the gold standard for evaluating a medical intervention. In addition, the best dose of NSAIDs for cancer prevention is not yet known. Barrett's esophagus is a premalignant - not malignant - condition. Its malignant sequela, esophagogastric junctional adenocarcinoma, has a mortality rate of over 85%. The risk of developing esophageal adenocarcinoma in people who have Barrett's esophagus has been estimated to be 6–7 per 1000 person-years, however a cohort study of 11,028 patients from Denmark published in 2011 showed an incidence of only 1.2 per 1000 person-years (5.1 per 1000 person-years in patients with dysplasia, 1.0 per 1000 person-years in patients without dysplasia). The relative risk of esophageal adenocarcinoma is approximately 10 in those with Barrett's esophagus, compared to the general population. Most patients with esophageal carcinoma survive less than one year. The incidence in the United States among Caucasian men is eight times the rate among Caucasian women and five times greater than African American men. Overall, the male to female ratio of Barrett's esophagus is 10:1. Several studies have estimated the prevalence of Barrett's esophagus in the general population to be 1.3% to 1.6% in two European populations (Italian and Swedish), and 3.6% in a Korean population. A further association was made with adenocarcinoma in 1975. ^ a b c d e Shaheen NJ, Richter JE (March 2009). "Barrett's oesophagus". Lancet. 373 (9666): 850–61. doi:10.1016/S0140-6736(09)60487-6. PMID 19269522. ^ Koppert LB, Wijnhoven BP, van Dekken H, Tilanus HW, Dinjens WN (December 2005). "The molecular biology of esophageal adenocarcinoma". Journal of Surgical Oncology. 92 (3): 169–90. doi:10.1002/jso.20359. PMID 16299787. ^ Stein HJ, Siewert JR (1993). "Barrett's esophagus: pathogenesis, epidemiology, functional abnormalities, malignant degeneration, and surgical management". Dysphagia. 8 (3): 276–88. doi:10.1007/BF01354551. PMID 8359051. ^ Shaheen, Nicholas J.; Falk, Gary W.; Iyer, Prasad G.; Gerson, Lauren B.; American College of Gastroenterology (January 2016). "ACG Clinical Guideline: Diagnosis and Management of Barrett's Esophagus". The American Journal of Gastroenterology. 111 (1): 30–50, quiz 51. doi:10.1038/ajg.2015.322. ISSN 1572-0241. PMID 26526079. ^ a b Allison PR (March 1948). "Peptic ulcer of the oesophagus". Thorax. 3 (1): 20–42. doi:10.1136/thx.3.1.20. PMC 1018255. PMID 18904843. ^ a b c Bani-Hani KE, Bani-Hani BK (May 2008). "Columnar-lined esophagus: time to drop the eponym of "Barrett": Historical review". Journal of Gastroenterology and Hepatology. 23 (5): 707–15. doi:10.1111/j.1440-1746.2008.05386.x. PMID 18410605. ^ Katz-Summercorn, Annalise C.; Frankell, Alexander M.; Fitzgerald, Rebecca C. (2016-01-01). Genetics and Biomarkers in Barrett's Esophagus and Esophageal Adenocarcinoma. Barrett's Esophagus. pp. 37–60. doi:10.1016/B978-0-12-802511-6.00004-1. ISBN 9780128025116. ^ Edelstein ZR, Farrow DC, Bronner MP, Rosen SN, Vaughan TL (August 2007). "Central adiposity and risk of Barrett's esophagus". Gastroenterology. 133 (2): 403–11. doi:10.1053/j.gastro.2007.05.026. PMID 17681161. ^ Reid BJ, Li X, Galipeau PC, Vaughan TL (February 2010). "Barrett's oesophagus and oesophageal adenocarcinoma: time for a new synthesis". Nature Reviews. Cancer. 10 (2): 87–101. doi:10.1038/nrc2773. PMC 2879265. PMID 20094044. ^ Gong L, Debruyne PR, Witek M, Nielsen K, Snook A, Lin JE, et al. (August 2009). "Bile acids initiate lineage-addicted gastroesophageal tumorigenesis by suppressing the EGF receptor-AKT axis". Clinical and Translational Science. 2 (4): 286–93. doi:10.1111/j.1752-8062.2009.00131.x. PMC 5407481. PMID 20443907. ^ Debruyne PR, Witek M, Gong L, Birbe R, Chervoneva I, Jin T, et al. (April 2006). "Bile acids induce ectopic expression of intestinal guanylyl cyclase C Through nuclear factor-kappaB and Cdx2 in human esophageal cells". Gastroenterology. 130 (4): 1191–206. doi:10.1053/j.gastro.2005.12.032. PMID 16618413. ^ Navab, Farhad; Avunduk, Canan; Gang, David; Frankel, Kenneth (1996). "Bulimia nervosa complicated by Barrett's esophagus and esophageal cancer". Gastrointestinal Endoscopy. 44 (4): 492–494. doi:10.1016/S0016-5107(96)70110-4. Retrieved 28 July 2018. ^ "Bulimia and cancer - what you need to know - Bulimia Help". Bulimiahelp.org. Retrieved 28 July 2018. ^ a b Fléjou JF (March 2005). "Barrett's oesophagus: from metaplasia to dysplasia and cancer". Gut. 54 Suppl 1: i6–12. doi:10.1136/gut.2004.041525. PMC 1867794. PMID 15711008. ^ a b Bennett C, Moayyedi P, Corley DA, DeCaestecker J, Falck-Ytter Y, Falk G, et al. (May 2015). "BOB CAT: A Large-Scale Review and Delphi Consensus for Management of Barrett's Esophagus With No Dysplasia, Indefinite for, or Low-Grade Dysplasia". The American Journal of Gastroenterology. 110 (5): 662–82, quiz 683. doi:10.1038/ajg.2015.55. PMC 4436697. PMID 25869390. ^ Pohler E, Craig AL, Cotton J, Lawrie L, Dillon JF, Ross P, et al. (June 2004). "The Barrett's antigen anterior gradient-2 silences the p53 transcriptional response to DNA damage". Molecular & Cellular Proteomics. 3 (6): 534–47. doi:10.1074/mcp.M300089-MCP200. PMID 14967811. ^ Murray E, McKenna EO, Burch LR, Dillon J, Langridge-Smith P, Kolch W, et al. (December 2007). "Microarray-formatted clinical biomarker assay development using peptide aptamers to anterior gradient-2". Biochemistry. 46 (48): 13742–51. doi:10.1021/bi7008739. PMID 17994709. ^ Salemme M, Villanacci V, Cengia G, Cestari R, Missale G, Bassotti G (February 2016). "Intestinal metaplasia in Barrett's oesophagus: An essential factor to predict the risk of dysplasia and cancer development". Digestive and Liver Disease. 48 (2): 144–7. doi:10.1016/j.dld.2015.10.021. PMID 26614646. ^ Çoban Ş, Örmeci N, Savaş B, Ekiz F, Ensari A, Kuzu I, Palabıyıkoğlu M (2013). "Evaluation of Barrett's esophagus with CK7, CK20, p53, Ki67, and COX2 expressions using chromoendoscopical examination". Diseases of the Esophagus. 26 (2): 189–96. doi:10.1111/j.1442-2050.2012.01352.x. PMID 22591041. ^ Odze RD (October 2006). "Diagnosis and grading of dysplasia in Barrett's oesophagus". Journal of Clinical Pathology. 59 (10): 1029–38. doi:10.1136/jcp.2005.035337. PMC 1861756. PMID 17021130. ^ Bibbò S, Ianiro G, Ricci R, Arciuolo D, Petruzziello L, Spada C, Larghi A, Riccioni ME, Gasbarrini A, Costamagna G, Cammarota G.
Barrett's oesophagus and associated dysplasia are not equally distributed within the esophageal circumference.Dig Liver Dis. 2016 Sep;48(9):1043-7. doi: 10.1016/j.dld.2016.06.020. ^ Schlemper RJ, Riddell RH, Kato Y, Borchard F, Cooper HS, Dawsey SM, et al. (August 2000). "The Vienna classification of gastrointestinal epithelial neoplasia". Gut. 47 (2): 251–5. doi:10.1136/gut.47.2.251. PMC 1728018. PMID 10896917. ^ a b Fleischer DE, Overholt BF, Sharma VK, Reymunde A, Kimmey MB, Chuttani R, et al. (October 2010). "Endoscopic radiofrequency ablation for Barrett's esophagus: 5-year outcomes from a prospective multicenter trial". Endoscopy. 42 (10): 781–9. doi:10.1055/s-0030-1255779. PMID 20857372. ^ a b Shaheen NJ, Sharma P, Overholt BF, Wolfsen HC, Sampliner RE, Wang KK, et al. (May 2009). "Radiofrequency ablation in Barrett's esophagus with dysplasia". The New England Journal of Medicine. 360 (22): 2277–88. doi:10.1056/NEJMoa0808145. PMID 19474425. ^ a b Shaheen NJ, Overholt BF, Sampliner RE, Wolfsen HC, Wang KK, Fleischer DE, et al. (August 2011). "Durability of radiofrequency ablation in Barrett's esophagus with dysplasia". Gastroenterology. 141 (2): 460–8. doi:10.1053/j.gastro.2011.04.061. PMC 3152658. PMID 21679712. ^ a b van Vilsteren FG, Pouw RE, Seewald S, Alvarez Herrero L, Sondermeijer CM, Visser M, Ten Kate FJ, Yu Kim Teng KC, Soehendra N, Rösch T, Weusten BL, Bergman JJ (June 2011). "Stepwise radical endoscopic resection versus radiofrequency ablation for Barrett's oesophagus with high-grade dysplasia or early cancer: a multicentre randomised trial". Gut. 60 (6): 765–73. doi:10.1136/gut.2010.229310. PMID 21209124. ^ Overholt BF, Wang KK, Burdick JS, Lightdale CJ, Kimmey M, Nava HR, et al. (September 2007). "Five-year efficacy and safety of photodynamic therapy with Photofrin in Barrett's high-grade dysplasia". Gastrointestinal Endoscopy. 66 (3): 460–8. doi:10.1016/j.gie.2006.12.037. PMID 17643436. ^ Galipeau PC, Li X, Blount PL, Maley CC, Sanchez CA, Odze RD, et al. (February 2007). "NSAIDs modulate CDKN2A, TP53, and DNA content risk for progression to esophageal adenocarcinoma". PLoS Medicine. 4 (2): e67. doi:10.1371/journal.pmed.0040067. PMC 1808095. PMID 17326708. ^ Reshamwala PA, Darwin PE (September 2006). "Endoscopic management of early gastric cancer". Current Opinion in Gastroenterology. 22 (5): 541–5. doi:10.1097/01.mog.0000239870.04457.80. PMID 16891887. ^ Abbas AE, Deschamps C, Cassivi SD, Allen MS, Nichols FC, Miller DL, et al. (February 2004). "Barrett's esophagus: the role of laparoscopic fundoplication". The Annals of Thoracic Surgery. 77 (2): 393–6. doi:10.1016/S0003-4975(03)01352-3. PMID 14759403. ^ Corley DA, Kerlikowske K, Verma R, Buffler P (January 2003). "Protective association of aspirin/NSAIDs and esophageal cancer: a systematic review and meta-analysis". Gastroenterology. 124 (1): 47–56. doi:10.1053/gast.2003.50008. PMID 12512029. ^ Vaughan TL, Dong LM, Blount PL, Ayub K, Odze RD, Sanchez CA, Rabinovitch PS, Reid BJ (December 2005). "Non-steroidal anti-inflammatory drugs and risk of neoplastic progression in Barrett's oesophagus: a prospective study". The Lancet. Oncology. 6 (12): 945–52. doi:10.1016/S1470-2045(05)70431-9. PMID 16321762. ^ Holmes RS, Vaughan TL (January 2007). "Epidemiology and pathogenesis of esophageal cancer". Seminars in Radiation Oncology. 17 (1): 2–9. doi:10.1016/j.semradonc.2006.09.003. PMID 17185192. ^ Thomas T, Abrams KR, De Caestecker JS, Robinson RJ (December 2007). "Meta analysis: Cancer risk in Barrett's oesophagus". Alimentary Pharmacology & Therapeutics. 26 (11–12): 1465–77. doi:10.1111/j.1365-2036.2007.03528.x. PMID 17900269. ^ Yousef F, Cardwell C, Cantwell MM, Galway K, Johnston BT, Murray L (August 2008). "The incidence of esophageal cancer and high-grade dysplasia in Barrett's esophagus: a systematic review and meta-analysis". American Journal of Epidemiology. 168 (3): 237–49. doi:10.1093/aje/kwn121. PMID 18550563. ^ a b Hvid-Jensen F, Pedersen L, Drewes AM, Sørensen HT, Funch-Jensen P (October 2011). "Incidence of adenocarcinoma among patients with Barrett's esophagus". The New England Journal of Medicine. 365 (15): 1375–83. doi:10.1056/NEJMoa1103042. PMID 21995385. ^ Polednak AP (May 2003). "Trends in survival for both histologic types of esophageal cancer in US surveillance, epidemiology and end results areas". International Journal of Cancer. 105 (1): 98–100. doi:10.1002/ijc.11029. PMID 12672037. ^ Zajac, P; Holbrook, A; Super, ME; Vogt, M (March–April 2013). "An overview: Current clinical guidelines for the evaluation, diagnosis, treatment, and management of dyspepsia". Osteopathic Family Physician. 5 (2): 79–85. doi:10.1016/j.osfp.2012.10.005. ^ Zagari RM, Fuccio L, Wallander MA, Johansson S, Fiocca R, Casanova S, et al. (October 2008). "Gastro-oesophageal reflux symptoms, oesophagitis and Barrett's oesophagus in the general population: the Loiano-Monghidoro study". Gut. 57 (10): 1354–9. doi:10.1136/gut.2007.145177. PMID 18424568. ^ Ronkainen J, Aro P, Storskrubb T, Johansson SE, Lind T, Bolling-Sternevald E, et al. (December 2005). "Prevalence of Barrett's esophagus in the general population: an endoscopic study". Gastroenterology. 129 (6): 1825–31. doi:10.1053/j.gastro.2005.08.053. PMID 16344051. ^ Kim JY, Kim YS, Jung MK, Park JJ, Kang DH, Kim JS, et al. (April 2005). "Prevalence of Barrett's esophagus in Korea". Journal of Gastroenterology and Hepatology. 20 (4): 633–6. doi:10.1111/j.1440-1746.2005.03749.x. PMID 15836715. ^ Barrett NR (October 1950). "Chronic peptic ulcer of the oesophagus and 'oesophagitis'". The British Journal of Surgery. 38 (150): 175–82. doi:10.1002/bjs.18003815005. PMID 14791960. ^ DeMeester SR, DeMeester TR (March 2000). "Columnar mucosa and intestinal metaplasia of the esophagus: fifty years of controversy". Annals of Surgery. 231 (3): 303–21. doi:10.1097/00000658-200003000-00003. PMC 1421001. PMID 10714623. ^ a b Allison PR, Johnstone AS (June 1953). "The oesophagus lined with gastric mucous membrane". Thorax. 8 (2): 87–101. doi:10.1111/j.1440-1746.2008.05386.x. PMC 1019247. PMID 13077502. ^ Naef AP, Savary M, Ozzello L (November 1975). "Columnar-lined lower esophagus: an acquired lesion with malignant predisposition. Report on 140 cases of Barrett's esophagus with 12 adenocarcinomas". The Journal of Thoracic and Cardiovascular Surgery. 70 (5): 826–35. PMID 1186274. Wikimedia Commons has media related to Barrett's esophagus.